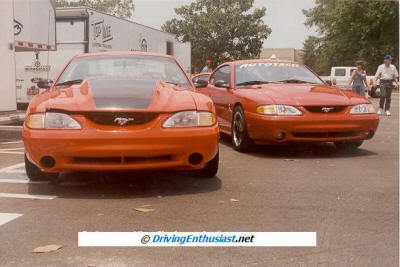 While we’re waiting for the huge number of introductions to start rolling out for the 2013 North American International Auto Show in Detroit next month, and while we’re eagerly awaiting further spy pictures of the 2015 Mustang, we thought it would be fun to pull out a project car from 1995: the infamous Ford SVE BOSS 604 from 1995. This is a John Coletti project car. But then, who else would have ever conceived of it? 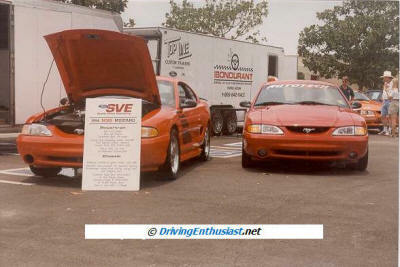 The SVE BOSS 604 was built by the Ford SVE team in response to a challenge from the “bow tie boys” across town. They had just put a 572-cube Donovan-built “rat motor” in a late-model Camaro and thought they were tough. In response, John sent the word out to build something with a motor exactly twice the size as stock: hence 604 cubes and 853 horsepower. Only little boys wear bow ties! 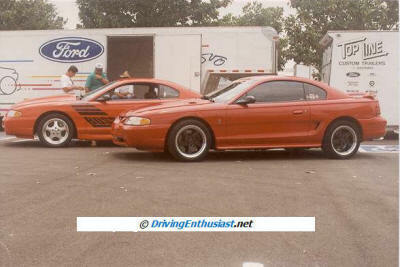 We encountered the BOSS 604 at the Houston Mustang Club of America show in August 1995. 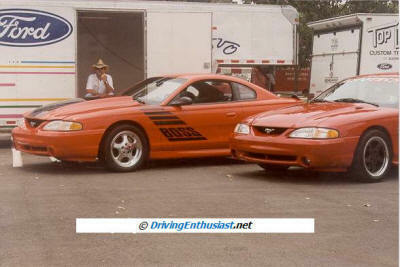 Ford brought the BOSS 604, and also a prototype of the 1996 4.6 DOHC Cobra. When we were asked which car we’d like to drive, we made the wrong choice and drove the Cobra prototype. 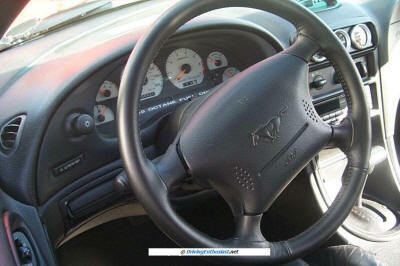 Or perhaps the right choice, since we liked the car so much we ordered one from our dealer the following Monday and took delivery that fall of the very first 1996 SVT Cobra in the State of Texas. The race against the bow tie boys didn’t take place as planned… a few years later we encountered Coletti again and he told us that the race would happen “any day soon” and that Car & Driver would likely report on it. We took this new opportunity to get some additional pictures of the car. 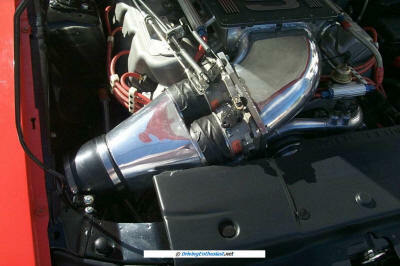 We noticed the intake has been slightly modified from what we’d seen before. Click on the images below for a high-res image. 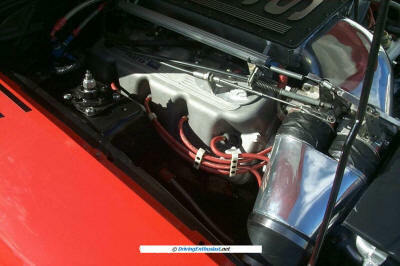 Intake path – Dual throttle bodies. 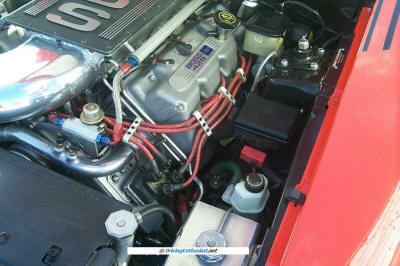 Engine compartment – details. Engine compartment – right side. 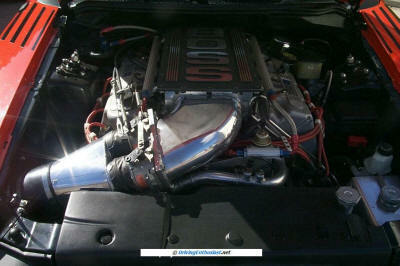 Engine compartment – left side. 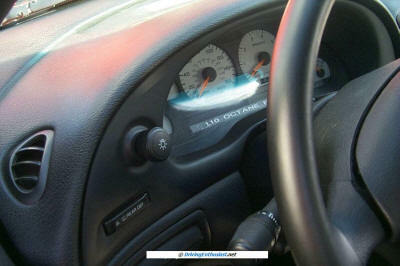 Dash – gauges. Dash – note sticker “110 octane fuel only”. Driving Enthusiast network: Ford Concepts, Prototypes, and Showcars section: this section of the parent site consists of pages and images of Ford, Lincoln, Mercury, SVE, FRP, SVT, and historical car and trucks concepts, prototypes, and showcars from Ford Motor Company. Many also have press releases.